So, yesterday I was wishing for more photography time. 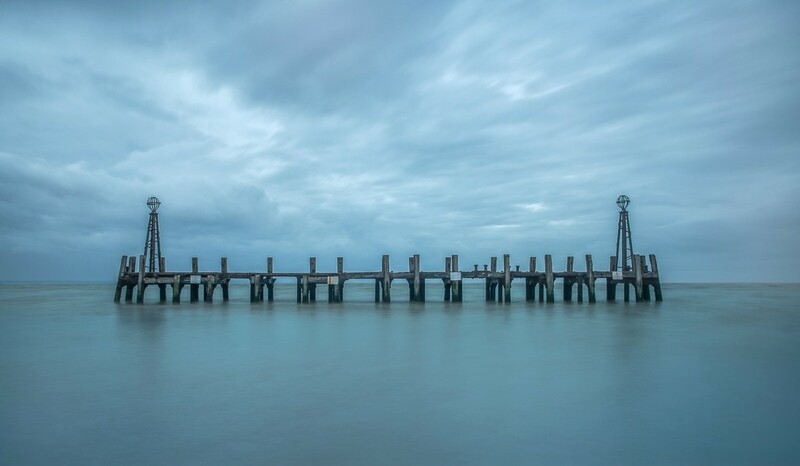 Today I was wading into the sea with wellies on, carrying tripod and camera on a photo club workshop to learn how to take long exposure shots of an old jetty. This was taken at high tide on the Lancashire coast, the sea was going over the top of everyone's wellies and we all ended up with wet feet but it was good fun. I was a bit worried about dropping my camera but we all returned to dry land without incident! Perfect titling for your experience. Neat shot with that jetty and all those blues. I would be scared of putting my camera on a tripod there - brave girl. This is an awesome shot! I love long exposures and this is really beautiful. Very nice! You are braver than me! I don't even like taking my camera out if it's raining a bit! An awesome capture, well worth getting wet for, fav! Love the tones here. Gorgeous shot.